Thisstory was updated at 7:08 a.m. ET. Anundocking system malfunction on the International Space Station has delayed thereturn to Earth for three astronauts in a Soyuz capsule by at least one day asRussian engineers try to understand what went wrong. Theproblems began late Thursday (Sept. 23) when a set of hooks and latches on thespace station's Russian Poisk docking port refused to release their grip on theastronauts' Soyuzspacecraft linked to the port. TheSoyuz crew ? two Russian spaceflyers and one American ? had hoped to undock andland on the steppes of Kazakhstan in Central Asia early Friday morning localtime. They are now slated to land no earlier than early Saturday. "Well,we're not going to have another attempt today for the undocking," aRussian flight controller radioed the station crew. "We're going to givethe guys the go for the opening of the hatch and coming back into theISS." Afleet of 12 Russian recovery helicopters and other aircraft were gearing up forthe astronauts' return to Earth aat the time. Russianengineers at the station's Mission Control near Moscow are now aiming to tryagain late Friday night to undock the spacecraft. TheSoyuz TMA-18 spacecraft was slated to undock from the space station at 9:34p.m. EDT (0134 Sept. 24 GMT) in order to return two cosmonauts and one Americanastronaut back to Earth after six months in orbit. 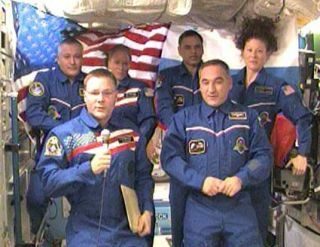 Aboardthe craft were American astronautTracy Caldwell Dyson and her Russian crewmates AlexanderSkvortsov and Mikhail Kornienko. Whiletrying to identify the cause of the glitch, Russian cosmonaut Fyodor Yurchikhinfound a gear with two broken teeth, though it is unclear what role the brokenpart may have played, if any, in the evening's troubles. Yurchikhinand two NASA astronauts ? Douglas Wheelock and Shannon Walker ? are remainingbehind on the InternationalSpace Station to complete their own space mission. Thespace station's Poiskdocking port is on the top of the orbiting laboratory's Russian segment. Itwas delivered in 2009 and entered use for visiting Russian spaceships earlierthis year. Thestuck hooks are on Poisk side of the docking port. These hooks, along withothers on the Soyuz side, ensure the spacecraft and station are securelyattached while docked. Duringthe undocking attempts, Russia's Mission Control center radioed words of encouragementto the Soyuz crew, telling the astronauts they could take off spacesuit glovesand get comfortable while they wait. Skvortsov,who is commanding the Soyuz trip to Earth, said he and his Soyuz crewmates weredoing well. Thescrapped undocking attempt capped a night of delays for the space station'sfull six-person crew. Earlier in the night, they had trouble sealing the hatchcover on the Poisk module docking port. NASAwill broadcast the upcoming Soyuz spacecraft undocking and landing live on NASA TV. Click here space station missionupdates and a link to NASA TV.